Legolas Exchange has created a platform that will bridge the gap between the cryptocurrency and fiat worlds, and is hoping to change the methods that cryptocurrencies can be used. The current crypto market is controlled by an exclusive group of exchanges and continues to face substantial scrutiny from the highest financial leaders. Cryptocurrencies, of course, have their positives and negatives. They are not constrained by the regulatory burdens that plague fiat currencies, but they can also be susceptible to hacks. Legolas intends to create a secure and transparent system so that financial institutions can participate in the cryptocurrency boom. The financial trading system is built on a decentralized ledger to get the best of both systems–security and transparency. The future looks amazing for cryptocurrencies. Though the price seems somewhat overreaching at the moment, the technology of crypto is starting to revolutionize the financial ecosystem. Blockchain systems are, though excellent, not without their disadvantages also. Hackers seem to appreciate cryptocurrencies, and breaches are prevalent and can often be heavily damaging to investors. A remarkable nearly $50 million was stolen in July and August, and this number includes just substantial hacks. The limited regulation within the crypto sphere has spawned substantial growth and speculation, all of which is positive for the freedom of the market. However, lack of regulation has also caused a proliferation of hacks to fleece the system. Exchanges refuse to accept responsibility for these breaches, much like fiat hack issues. Fiat currencies are just as vulnerable and reports frequently indicate a substantial number of of insider trading charges and false market reports. The legal institutions that govern fiat exchanges frequently deal with lawsuits whether petty manipulations or fraud – investors can’t help but remember the Madoff scandal, for example. Government regulations have been unable to do the jobs that the people pay them to accomplish. The SEC makes it clear that exchanges are not culpable for the security of any instruments they hold. Therefore, ironically, when hacks do occur, exchanges cannot be held liable. Additionally, the major governmental institutions who control fiat transactions are themselves subject to security hacks. Recent reports indicate that the SEC had its digital storage breached last year. What’s more, insider trades have occurred based upon the undisclosed material that was accessed. If even governmental bodies like the SEC can’t provide security and transparency within its own system, it should seem clear that such a system cannot possibly protect the or enforce crypto exchanges. Legolas Exchange provides remarkably elegant solutions to the problems facing both exchange platforms. By uniting both centralized and decentralized benefits, Legolas has been capable of revealing and stopping fraudulent transactions. Traditional decentralized cryptocurrency exchanges function without the otherwise mandatory reports or audits which governments provide. They also represent an unrealistic longterm solution, since their potential possible growth factor is just 25%. Legolas Exchange has created a system that allows for auditable trade history and order books. This means users can access real time PoT, and, because it combines aspects of both centralization and decentralization, full market adaptation is feasible. Legolas also ensures the security of their wallet. The wallet platform was conceived by a team of talented IT and finance professionals, making it unhackable. The platform is also designed to ensure the temporality of orders. Thus, manipulations like front-running are managed and controlled, resulting in an open and transparent fiscal environment. The platform is supported by PayQix, owner of BankQix, the Luxembourg-based banking institution. Legolas users’ Bitcoin accounts will thus be effectively theft-proof. The net effect of this system is that Bitcoins are at least as secure as fiat currency, which traditional cryptocurrency exchanges simply cannot offer. Legolas provides a workable solution to the questions that burden existing crypto and fiat currency exchanges. The exchange is powered by LGO tokens, which are able to be purchased through Legolas’ website. Bitcoin is the only accepted currency at this time, with LGO tokens being issued during the company’s ICO pre-sale. The production platform is scheduled to release in the first trimester of 2018, assuming the beta rollout is approved. 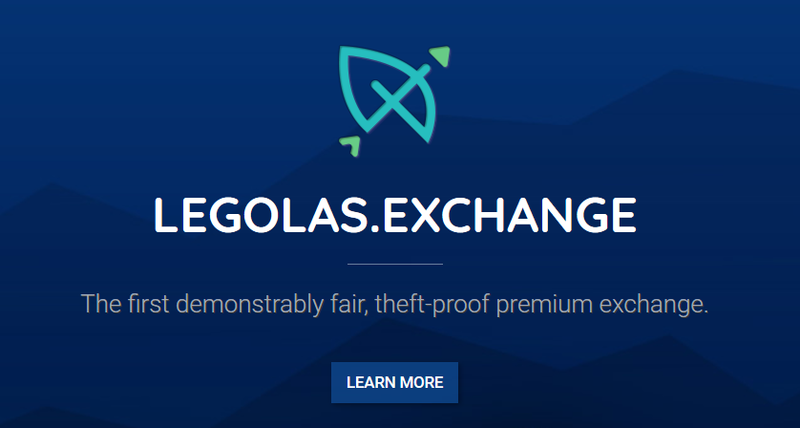 Legolas’ exchange is a welcome challenge that seeks to stabilize a new and relatively unstable marketplace.